I'm a Professor of computer science at Loyola College in Maryland, a comprehensive university with about 3000 undergraduates and a similar number of graduate students. My undergraduate degree is in Mathematics (BA University of Missouri 1980) and my graduate degrees are in Computer Science (MS 1986 and PhD 1990, both University of Maryland-College Park with Larry Davis as advisor). My teaching focuses on introductory programming (CS1 and CS2), introduction to computer science (CS0), and computer imaging courses (three-dimensional graphics, user interface design and image processing). Since Loyola has no PhD program, faculty do their research with undergraduates. I've been fortunate to have some excellent students to work with over the years. They have gone to graduate work at University of Maryland-College Park, Virginia Tech, Georgia Tech, Johns Hopkins. 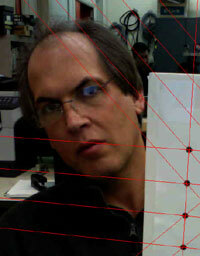 My research has focused on image registration, which is the alignment of digital images taken in various applications. In the past few years the application has been to Earth satellite imagery supported by research grants from NASA, but as of 2006 there is a new line of research in collaboration with a group at NIST into 3D imaging sensors and their applications in manufacturing and mobile robotics. With my colleagues at NASA, we've completed a book on image registration for remote satellite sensing applications. The book will come out this October from Cambridge Press. See the link below. With my colleagues at NIST, we've started research programs on advanced sensors for manufacturing robotics, funded by NIST internal programs. Adaptive Mobile Robotics: Proceedings of the 15th International Conference on Climbing and Walking Robots and the Support Technologies for Mobile Machines(Hardback) Edited by: A K M Azad (Northern Illinois University, USA), N J Cowan (Johns Hopkins University, USA), M O Tokhi (University of Sheffield, UK), G S Virk (University of Gävle, Sweden), R D Eastman (Loyola University Maryland, USA). World Scientific Press, July 2012. Book at World Scientific . Image Registration for Remote Sensing (Hardback) Edited by Jacqueline Le Moigne, Nathan S. Netanyahu, Roger D. Eastman. Cambridge University Press, October 2010. Book at Cambridge Press . Also see Amazon.com. Michael Price, Jacqueline Kenney, Roger D. Eastman, Tsai Hong "Training and Optimization of Operating Parameters for Flash LADAR Cameras", 2007 IEEE International Conference on Robotics and Automation, April 11-13, Rome Italy. Jacqueline Le Moigne, Arlene Cole-Rhodes, Roger Eastman, Peyush Jain, Amiee Joshua, Nargess Memarsadeghi, David Mount, Nathan Netanyahu, Jeffery Morsisette and Ezinne Uko-Ozoro, "Image registration and fusion studies for the integration of multiple remote sensing data", International Conference on Acoustics, Speech and Signal Processing 2006, Toulouse, France. With Jacqueline Le Moigne, "Registration of Multiple Sensor Earth Science Data", in R. S. Blum and Zheng Liu, "Multi-Sensor Image Fusion and Its Applications'', CRC Press Sept. 2005 in the special series on Signal Processing and Communications. "Earth Science Imagery Registration", Jacqueline Le Moigne, Arlene Cole-Rhodes, Kisha Johnson, Jeffery Morisette, Nathan S. Netanyahu, Roger Eastman, Harold Stone, Ilya Zavorin, IEEE International Geoscience and Remote Sensing Symposium (IGARSS) 2003, volume 1, pages 161-163. Jacqueline Le Moigne, Arlene Cole-Rhodes, Roger Eastman, Tarek El-Ghazawi, Kisha Johnson, Sinthop Kaewpijit, Nadine Laporte, Jeffrey Morisette, Nathan S. Netanyahu, Harold S. Stone, Ilya Zavorin, "Multiple Sensor Image Registration, Image Fusion and Dimension Reduction of Earth Science Imagery", The 4th Int. Conf. on Information Fusion, Annapolis, Maryland, April 2002. Jacqueline Le Moigne, Arlene Cole-Rhodes, Roger Eastman, Kisha Johnson, Jeffrey Morisette, Nathan S. Netanyahu, Harold S. Stone, and Ilya Zavorin, "Multi-Sensor Image Registration for On-The-Ground or On-Board Science Data Processing", Science Data Processing Workshop, Greenbelt, Maryland, February 2002. J. Le Moigne, A. Cole-Rhodes, R. Eastman, K. Johnson, J. Morisette, N. Netanyahu, H. Stone, and I. Zavorin, "Multi-Sensor Registration of Earth Remotely Sensed Imagery," 8-th SPIE Int. Symp. Remote Sensing, Image and Signal Processing for Remote Sensing VII, Vol. #4541, France, September 2001. R. Eastman and J. Le Moigne, "Gradient Descent Techniques for Multi-temporal and Multi-Sensor Image Registration of Remotely Sensed Imagery", The 4th Int. Conf. on Information Fusion, Montreal, Canada, August 2001.